Be honest, is anyone else getting bored of this challenge yet? It can't just be me. That said, there's not long now, I'm sure. I'm working my way through my list of remaining pairs. I'm afraid it's another round-up so soon after the last purely because I've been feeling so under the weather for the past week that I have just not been in the mood to take outfit photos. A new pair for Day 206, but one which I know I'll get a LOT of wear from when I have finished the challenge. A first wear for Dippy Daisy on day 205 and for Pink Primrose on day 200. Love them both. 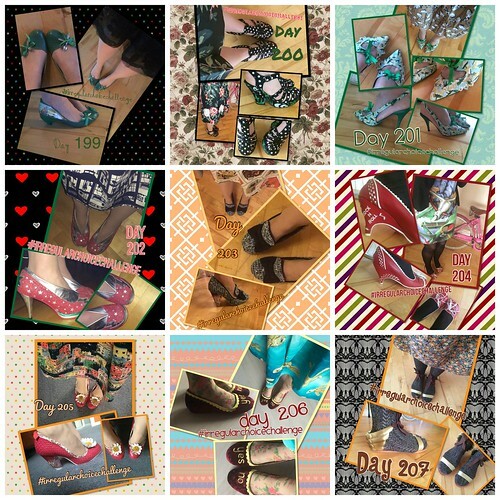 Almost at the end of the challenge - I don't know how I'll choose what pair to wear when I have the complete freedom of all of my shoes again. Aw, thanks - it's sort of mad to think how many pairs of shoes I seem to have! I think I got weary towards the end of mine too. I love the daisy ones, I wanted them when they popped into the sales, but of course my size was out of stock. Love those panda ones too. Your new flats look brilliant. Thanks!! I cant' believe I'm almost done, and yet sometimes it feels as though this has been going forever. Could never get bored of your shoes. Such an amazing collection. Really enjoyed it! Think I'm into the final fortnight now! !